The stock market rebounded yesterday rising by 0.80 per cent in reaction to the decision of the Central Bank of Nigeria (CBN)’s Monetary Policy Committee (MPC) to address the lingering concern around the exchange rate among others issues. 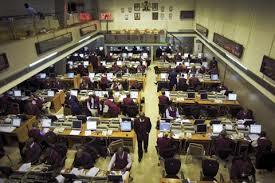 The market had declined the previous day as some investors took profits while others awaited the decisions of the MPC. However, stocks rebounded with the Nigerian Stock Exchange (NSE) All-Share Index rising 0.80 per cent to close at 27,231.50, while market capitalisation added N74.02 billion to close at N9.35 trillion. The gains increased the NSE ASI’s month-to-date appreciation to 7.7 per cent, while the year-to-date loss reduced to 5.68 per cent. The positive performance was driven by gains recorded by Guaranty Trust Bank Plc, Dangote Cement Plc and Nigerian Breweries Plc. In all, 29 stocks appreciated , compared with 19 stocks that depreciated. Investors traded N276.2 million valued at N1.53 billion in 4,160 deals. Some analysts said they expect investors to react positively to the outcome of MPC meeting. At the conclusion of its third meeting for the year yesterday, the MPC decided to hold all rates unchanged. The added that although the actual impact of the recent move to embrace flexibility in the currency market is difficult to analyse at the moment given that the details of the operation of the planned flexibility is yet to be announced. “Nevertheless, we believe the move by the MPC to address the currency market crisis is a step in the right direction,” they said.